The Online Food Revolution Is Here—Are You Ready? The Online Food Revolution Is Here—Are You Ready? Online retail can be a timesaver in many ways. Not only does it make desired goods available in only a few clicks, but it also saves you the time that ordinarily would have been spent out shopping. As the online retail market continues to grow, the availability of all products is quickly becoming a reality. Before, you might have turned to online retail for products like clothing, books, or electronics. But did you know that you can now look to the online market to fill your grocery needs as well? Get ready for the fresh and frozen food online revolution. Imagine you want to prepare a nice, healthy meal, but don’t feel like having to “hunt” for the right ingredients in the supermarket. You’re busy at work and have a booked schedule for the evening, so you won’t be able to do your grocery shopping before the supermarket closes. No problem, there are online services that take the hassle out of food preparation. Simply choose the items you want, and you’ll receive them the next (or even the same) day. Why bother making an extra trip to the store when there are services that deliver fresh ingredients and needed recipes right to your doorstep? The Tipping Point of Fresh and Frozen Food Online Retail. Ordering fresh and frozen food online seems to be the next “big thing” in online retail. In the United states and Europe, online retailers have been pioneering fresh and frozen food online retail for several years. Even supermarkets have started exploring this trend. But with leading global online mass-merchants entering the food product industry, we’re likely to see the game change. According to Statista, the established customer base of these online leaders amounted to several hundred million active customers in 2014. Add to this a wide and cost-efficient logistics network, and we’re looking at the tipping point of fresh and frozen online retail food sales—where speed and efficiency are critical. Ensuring Great Quality and Customer Experiences. Packing and shipping fresh and frozen products requires a different focus than when shipping non-perishables. Temperature and bacterial control become critical, and regulations for food safety are much more stringent. How quickly deliveries reach their destinations becomes even more important. Consequently, the replacement of manual operations with packaging automation is a logical solution when efficiency improvements and high-quality standards are required. Finding the right adhesive that delivers high performance on high-speed packing lines and resists supply chain temperatures from deep freeze to high heat will ensure that sensitive goods arrive in the customer’s hands undamaged and fresh. Damaged packaging can lead to food waste and disappointed customers which, in an online environment, can seriously harm the retailer’s reputation and put future business at risk. Once the delivery has arrived intact to the customer, it should be easily accessible without the need to use a knife or scissors, which could potentially cause damage to the contents and injure the customer. 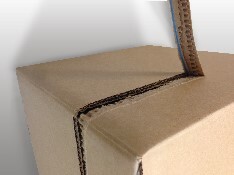 Easy-opening solutions, such as the Sesame® tapes integrated into the corrugated container, make it effortless to open the shipping box quickly and safely. Learn more about H.B. Fuller solutions for fresh and frozen packaging closure and opening.